Truthfully, Player never said the above quote inspired by the late humorist Will Rogers. But it came to mind last year when I watched a Champions Tour preview on television and heard Player say, “This is without question the most incredible Par-3 course in the world.” He was talking about Top of the Rock, one of the courses that serve as the venue for the Champions Tour’s Bass Pro Shop Legends of Golf at Big Cedar Lodge in Ridgedale, MO. This third annual tournament, won last year by the team of Billy Andrade and Joe Durant, begins this week amid the beautiful Ozark Mountains in southwest Missouri. At the time, I dismissed Player’s comments because they’re so typical of the ever complimentary and sponsor-friendly South African. But then I started watching the tournament action on television with its awe-inspiring views of the course and surroundings, and thought, “Maybe Gary’s got this one right.” But being somewhat of a skeptic, I decided to take a lesson from Missouri’s state motto: Show me! Last month I visited Big Cedar Lodge and played both of its courses, the celebrated Par-3 and Buffalo Ridge, the Tom Fazio design only a short drive from the Lodge. Here’s my quick takeaway: Wow! For a more detailed report, please read on. Top of the Rock: When I think of outstanding Par-3 courses, two come immediately to mind: Augusta National’s Par-3 seen annually at the Masters; and Threetops at the Treetops Resort in Gaylord, Michigan, the venue for a made-for-television shoot-out on ESPN many years ago. After traveling to Springdale, I will now include the Top of the Rock Par-3, a Jack Nicklaus Signature design. It’s extraordinary. 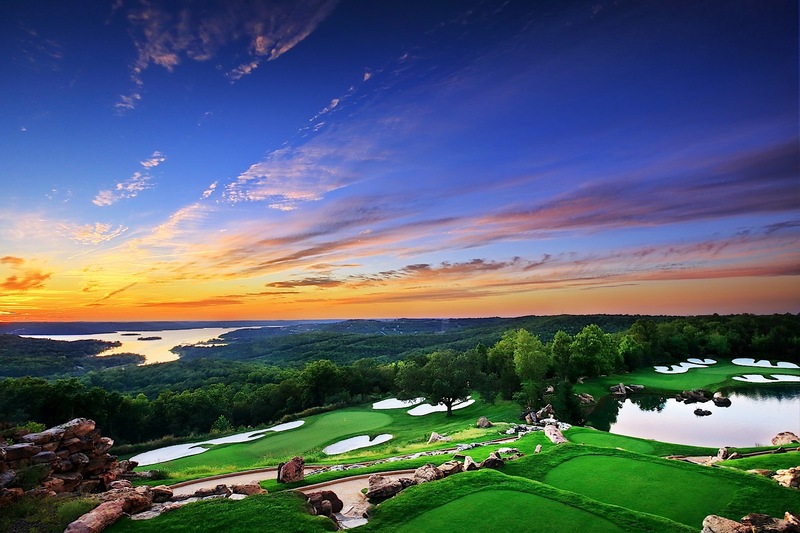 From the get-go, the views from the clubhouse and the magnificent practice area (by Arnold Palmer Design) of the Ozark Mountains and Table Rock Lake are off the charts. And the course itself is a bold and fun test of golf with championship-caliber bunkering, ponds, rock formations and intriguing green complexes. If one chooses the correct tees, it’s not as intimidating as it first appears. The course conditions, even in early March and with the benefit of El Nino and with the myrtle blooming, were very good and the ball rolled well on the greens. With its stunning elevated views, the first four holes are majestic. The second hole with its hundred-foot drop and pointing out over Table Rock is spectacular, particularly with the added spice of a birdie. The island green 6th hole at 121 yards from the back tees is another delight but in truth there’s not a weak or casually conceived hole in the bunch. Without giving away the plot, the course ends with a fitting and most picturesque flourish. As I holed out my final putt, one thought came to mind: emergency nine, please! One cautionary note: the rock formations and steps for some of the back tees can be treacherous for the faint of foot, especially in slippery conditions. Without the benefit of hand rails, these steps require one’s full attention. Eric Smith is the head PGA golf professional at Top of the Rock. Interestingly enough, he’s a Michigan native having grown up in the Kalamazoo area. He spent seven years as head pro at Lake Cora GC in Paw Paw before arriving in Springdale ahead of the inaugural Bass Pro Shops Legends of Golf tournament in 2014. By that time, the course—which originally opened in 1996— had undergone a major renovation by Nicklaus Design, adding tee boxes and converting the grasses to bent. In fact, this new and improved version of the par-3 made its debut with the Champions tournament. “Although the course was well-known in the region for many years, it became nationally recognized by the renovation and by the televised event,” said Smith. Among Smith’s favorite holes is the 152-yard 7th hole. “It’s somewhat of a reverse image of Augusta National’s 16th hole with how the greens, bunkers and lake all are placed. I’m a big fan of Fazio as a designer and how he shapes his designs into the natural topography. Seldom do you find an overly contrived and ill-advised golf hole on a Fazio course. And this is this case with Buffalo Ridge with golf holes having a comfortable pace and flow over the panoramic landscape without being too penal. Typical of most Fazio designs, there’s plenty of room off the tee and most of the holes have open approaches to the greens. I enjoyed playing the par-5 eighth hole, an uphill test marked by cascading water along the left side and woods and rock along the right. The green has a false front so the approach shot must be well-struck to hold onto the putting surface. Behind the green, there’s an old mine shaft entrance that’s fenced off but leaves a nice reminder of the area’s ore mining days. Add a most impressed and most surprised Michigander to this list. After seeing the world-class accommodations, amenities and attractions at Big Cedar Lodge, another thought came to mind: Who is Johnny Morris and how did this staggering resort all come about? Morris grew up in the area. In fact, as a 10-year-old lad in 1958, he witnessed the pivotal opening of Table Rock Dam, a U.S. Army Corps of Engineers project, on the White River which created the expansive Table Rock Lake and reservoir. Morris loved fishing in these waterways and the love for the outdoors and its history became embedded in his DNA. His business success started in 1971 when he started a small fishing and tackle shop at his dad’s liquor shop in Springfield, MO. That was the forerunner of Bass Pro Shops that now has become a leading outdoor retailer in the US with more than 90 stores. In 1978, Morris introduced Bass Tracker, the first boat, motor, and trailer package designed just for anglers. Today, Bass Tracker is the #1 selling fishing boat in America. Looking for a possible marina on Table Rock Lake to host his customers’ boats, Morris bought instead a nearby lodge and acreage in 1987 and methodically transformed it into a destination property. Years later, Morris purchased 242 acres of land where Top of the Rock now rests, the highest point in the county with terrific views of the mountains and lakes. He built a restaurant, clubhouse and added the Jack Nicklaus-designed Par-3 which opened in 1996. However, a fire in the restaurant closed Top of the Rock in 2005 and the site generally went dormant until 2014. That June, Top of the Rock reopened in spectacular fashion: a renovated Par-3, four new restaurants, 2.5 mile nature trail, practice range by Arnold Palmer, Himalayan putting green by Tom Watson, a natural history museum, a wedding chapel and cabin—all with those same jaw-dropping views. Oh yes, by then Morris had secured the Legends of Golf tournament as a way to cast the property to a wider array of guests. A proven and visionary angler, Johnny Morris is now reeling them in.